WFilter Enterprise, email filter, IM filter, p2p blocker ... all in one. 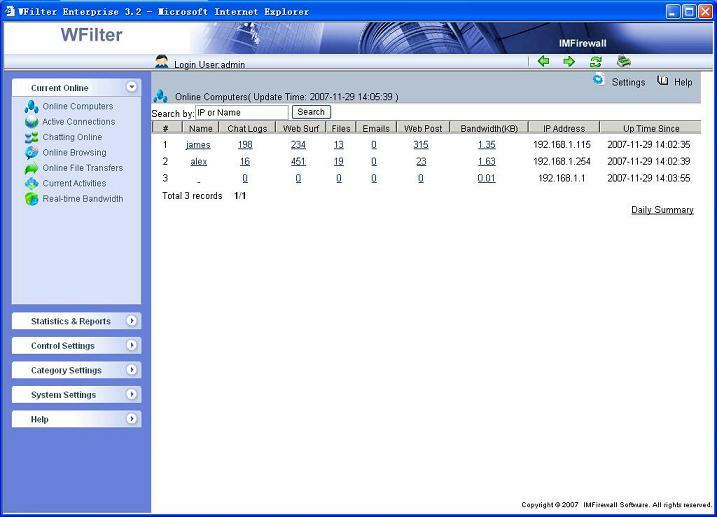 WFilter is an Internet filtering software that can help organizations to monitor and manage all Internet behaviors in their networks. WFilter intercepts, records and monitors Internet behaviors of users, for the purpose of ensuring policy compliance, or measurement on job performance in an organization. You only need to install WFilter in one computer to monitor all PCs. * Record all incoming and outgoing email content and attachment. * Monitor and archive instance messengers chat contents and activities. * Monitor and archive files transferred by web, ftp and IM tools. * Customizable email usage control policy. * Detect and block P2P traffic. * Detect and block online streaming media. * Detect and block online gaming, stock software and others. * Support up to 91 protocols and software. Qweas is providing links to WFilter Enterprise 4.0.137 as a courtesy, and makes no representations regarding WFilter Enterprise or any other applications or any information related thereto. Any questions, complaints or claims regarding this application WFilter Enterprise 4.0.137 must be directed to the appropriate software vendor. You may click the publisher link of WFilter Enterprise on the top of this page to get more details about the vendor.